The OpenNebula monthly newsletter, with latest developments, events and future plans for the upcoming months from the OpenNebula project. Read this newsletter to keep up to date with your favourite Cloud Management Platform. The OpenNebulaConf 2016 will be held in Barcelona on the 24-26 of October. The final agenda has already been published, take a look at the interesting keynotes from industry leaders. You also might be interested in taking a look at the sponsorship opportunities. If you are willing to attend, the early bird will be available until 15th of September. It seems like the community is also forgetting about the beach and just working hard! Well, may some of them are on the beach … and who can blame them? In any case, valuable contributions are being made to the OpenNebula ecosystem. The OpenNebula WHCMS and Blesta modules by CubeData is a long time favorite, especially among users of OpenNebula in the hosting business, namely being able to integrate OpenNebula with a billing platform. The next OpenNebula Conference in Barcelona in October 2016 will take place 24 to 26 of October. The final agenda has already been published, take a look at the interesting keynotes from industry leaders, and to the different community sessions sharing OpenNebula experiences, and the workshops designed to learn about different OpenNebula aspects. If you are willing to attend, the early bird will be available until 15th of September. Learn about the different sponsorship opportunities in the Conference web page. Current sponsors of the OpenNebulaConf 2016 include StorPool and LINBIT as Platinum Sponsors, NodeWeaver as Gold Sponsors and Terradue and Todo En Cloud as Silver Sponsors. If you want to understand what all the OpenNebula Conference fuzz is about, check the last Conference material (talks, slides,pictures). Besides the TechDays already celebrated (in Kuala Lumpur, Sofia, Madrid, Dallas, Toronto, Cambridge, Ede, Nuremberg), this last month members of the OpenNebula team participated in a TechDay in Dublin, with an excellent turnout and very interesting talks, like the one by Stuart Kenny telling us how they use OpenNebula in the digital repository of Ireland, or John Walsh showing how they use OpenNebula at SCSS. Our friends at Netways also help greatly in spreading the work, kudos!. Like this presentation about OpenNebula and Foreman in the Foreman Birthday event. A new maintenance release of the OpenNebula 5.x Wizard series, 5.0.2, has been released and is available for download. Resize capabilities for VR context. Assign IP address to PCI-passthrough devices. Modify cardinality of VR HA. Stop public users to be able to change their password. Display colors for the labels. Search users by password field. Implement oneuser login in Sunstone. New action: VR Template instantiate. Service create dialog in admin view. VM configuration tab can now be enabled in cloud view. Fix for VM modals in Cloud View. Fix for multiple value cluster attributes matching with automatically generated CLUSTER_ID. Migrator created public marketplace with zone -1. Missing links for default monitor scripts. vCenter upload does not recognize new mime types. Cannot attach NIC if contextualization missing in KVM VM. If the dashboard tab is not enabled, the loading icon is not cleared. Service create and Service template instantiate repeat datatable IDs. VNet AR update does not select the right type. Sunstone session does not set zone_id. Changing owner or group of a service result in “Bad request”. groupadmin_vcenter view can’t create new VMs. VM template delete dialog does not fill the selected res. names. Remove Save As Button from vCenter views. Labels container has style issues with a big number of labels, and long label names. Present VCPU and tie it to CPU in vCenter view. MB/GB text overlaps select arrow. Clone template modal does not have a close button. Labels are not working for VR instances. Auth_mad drivers are not listed in sunstone. Attach nic modal disappear when selecting page 2. VM control operations are not visiible when using firefox and sunstone in “dev” mode(while they are visible using chrome). Strange behavior with capacity modification and unit switching. Confirmation dialogs cannot be submitted using the enter key. vCenter shutdown VM does not work if CDROM attached. The OpenNebula team would like to thanks all members of the community that contributed hugely with their evaluation of the beta, RC, final stable version and first maintenance release and provided feedback on it. OpenNebula wouldn’t be half as good without you! https://opennebula.org/wp-content/uploads/2018/11/opennebula_cloud_logo_white_bg-4.png 0 0 Tino Vazquez https://opennebula.org/wp-content/uploads/2018/11/opennebula_cloud_logo_white_bg-4.png Tino Vazquez2016-07-22 07:44:582016-07-22 07:44:58OpenNebula 5.0.2 ‘Wizard’ Released! Next 28th August to 1st September the VMworld 2016 US will be held in Las Vegas, Nevada. This is a must attend event where almost everyone with an interest in virtualization and cloud computing will be networking with industry experts. The OpenNebula team will be present in the VMworld with a booth dedicated to showcase vOneCloud 2.0, the open source replacement for VMware vCloud. There will be a focus on new features like VMDK support, datastore and resource pool choosing and the Virtual Router functionality. If you are planning to attend VMworld next mont, make sure you register and do not forget to come around our booth, 769. You will be able to see in a live demo how a VMware based infrastructure can be turned into a cloud with a slick, fully functional self-service portal to deliver a VM catalog to your end users, in 5 minutes!. OpenNebula Conf 2016 is getting closer and we would like to keep sharing with you the companies/projects that are sponsoring this year’s conference. Now it is time for Todoencloud, as part of our Silver Sponsors. If you want to participate in OpenNebula Conf and meet Todoencloud and other OpenNebula users, remember that today is the deadline for getting a good price deal for tickets. 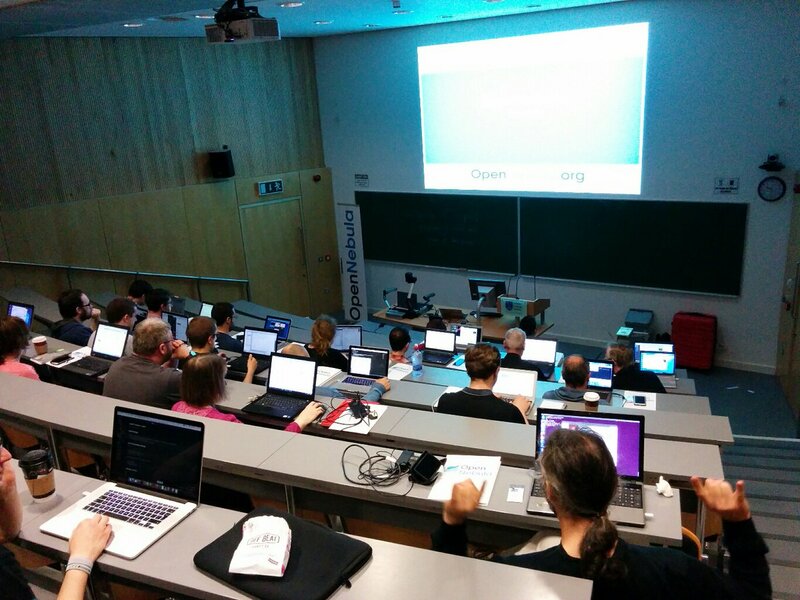 Also, if your company is interested in sponsoring OpenNebulaConf 2016 there are still slots. The OpenNebula monthly newsletter, with latest developments, events and future plans for the upcoming months from the OpenNebula project. Read this newsletter to keep up to date with your favorite Cloud Management Platform. The OpenNebulaConf 2016 will be held in Barcelona on the 24-26 of October. The preliminary agenda has already been published, the final version will soon be available. You might be interested in taking a look at the sponsorship opportunities. Check out the list of upcoming OpenNebula TechDays to see if there is one on your doorstep that you cannot miss. The first stable release of OpenNebula 5.0 Wizard has been published. The OpenNebula project is proud to announce the availability of the first stable release of OpenNebula 5.0 ‘Wizard’. This major update comes with several improvements in different subsystems and components, with minimal changes in the API and the VM life-cycle states, which embodies long overdue changes but implemented to minimize the impact and ensure backwards compatibility as far as possible. Also, a new maintenance release 5.0.1 fixing bugs reported by the community has also been published this month, fixing fix Ceph pool names, VM Template update wizard, oned crashes when a context variable contains a filter, PCI element in KVM deployment file, better checks for IPv4 strings, wrong attach disk in vCenter, VM instantiate when NIC contains a fixed IP, migration for STOPPED and UNDEPLOYED states and the apptemplate generation. We would like to thanks all members of the community that contributed hugely with their evaluation of the beta, RC and final stable version and provided feedback on it. We cannot emphasise this enough. The OpenNebula community is continuously contributing to the OpenNebula maturity and success, and we would like to thank you all for your excellent feedback on the several betas and RC of 5.0 Wizard. Also, the amazing job of the different translators has enabled the availability of the Sunstone web interface to 20 different languages. Kudos to you! The community shows its engagement in integrations like this one between OpenNebula and the Happy module by EOLE team, GO bindings for the OpenNebula Cloud API (OCA) by Megam and OpenNebula and Foreman by Netways. 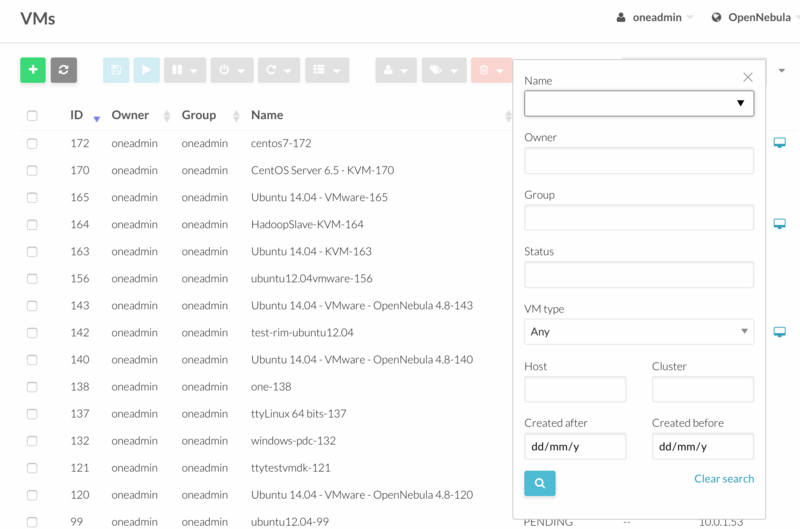 This enriches the OpenNebula ecosystem and shows its health, thanks! Also important is to spread the word, with initiatives like users groups and local meetups and workshops. 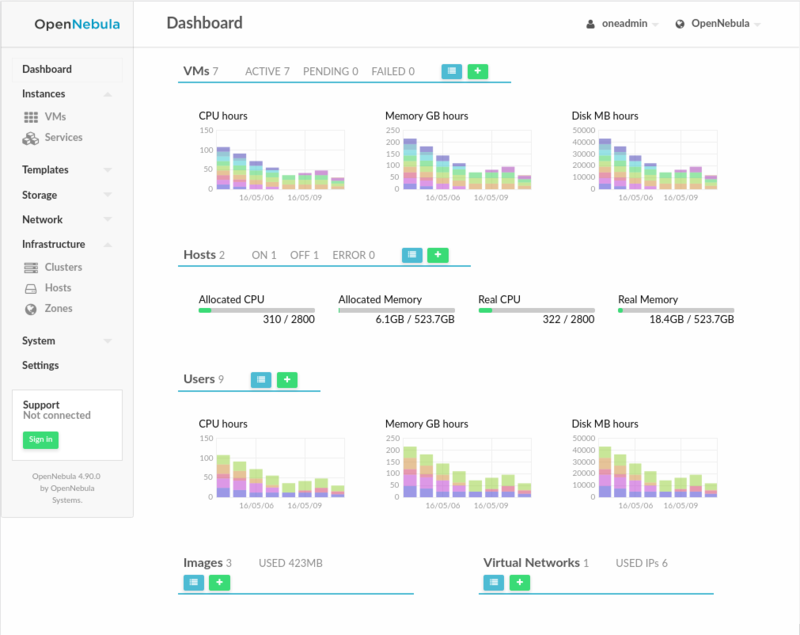 Also welcome are reviews in blogs, like this one about vOneCloud 2.0 (In French), or this excellently crafted post on OpenNebula and Docker Swarm with consul. And, as usual, is very good to be reminded about nice things, like for instance the amount of years we’ve been working to make OpenNebula a mature product that you can find today. The next OpenNebula Conference in Barcelona in October 2016 will take place 24 to 26 of October. The preliminary agenda has already been published, the final version will soon be available. If you are willing to attend, the early bird will be available until 15th of July. Learn about the different sponsorship opportunities in the Conference web page. Current sponsors of the OpenNebulaConf 2016 include StorPool and LINBIT as Platinum Sponsor, NodeWeaver as Gold Sponsor and Terradue and Todo En Cloud as Silver Sponsor. If you want to understand what all the OpenNebula Conference fuzz is about, check the last Conference material (talks, slides,pictures). 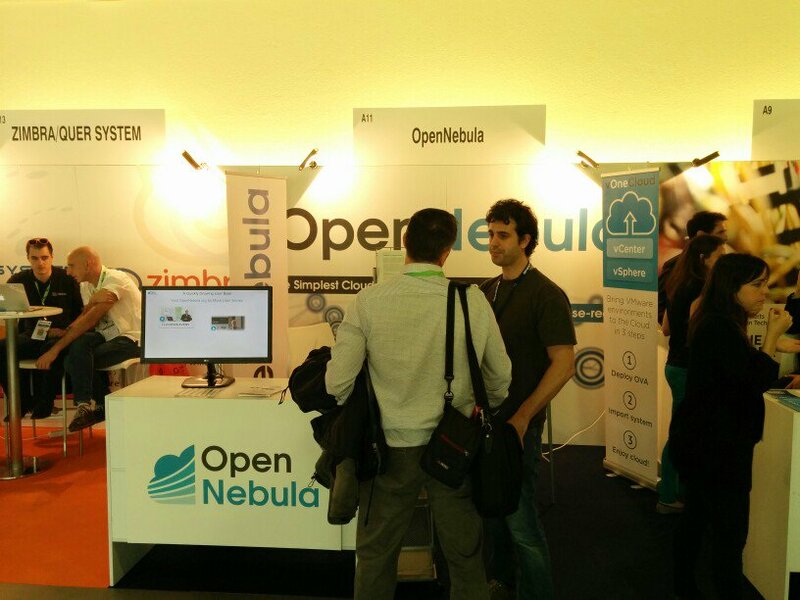 OpenNebula participated in the OpenExpo at Madrid, an event to promote and evaluate solutions and tendencies in the FLOSS industry. 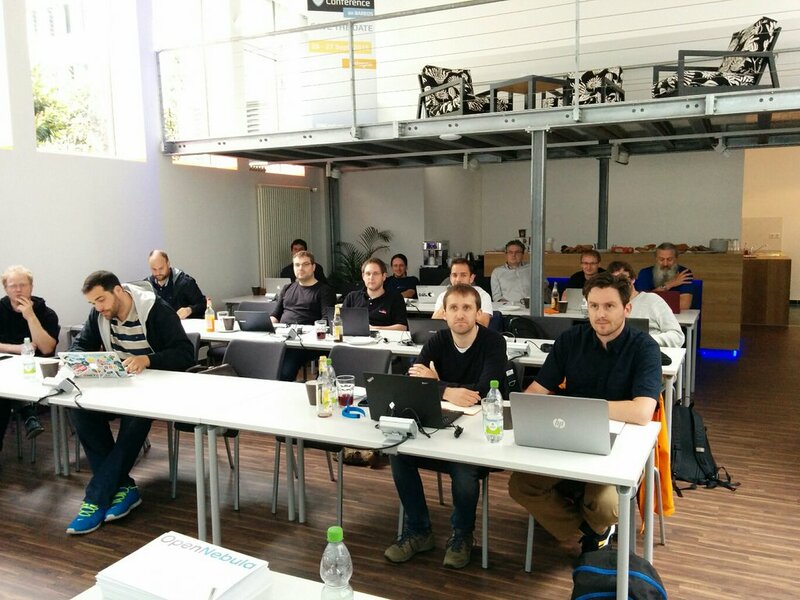 Members of the OpenNebula teams gave talks about the project and interesting integrations like Docker. OpenNebula also participated in the DINSIC meeting, where a work group decides which open source technologies they recommend for public french ministers. It is an honor to be there! Check out the projected OpenNebula TechDays for this year in case one is close to your location. If you are interested in participating in (or hosting) any of these TechDays agenda let us know. Besides the TechDays already celebrated (in Kuala Lumpur, Sofia, Madrid, Dallas, Toronto and Cambridge, Ede, Nuremberg), this year members of the OpenNebula team will be participating in a TechDay in Dublin. Stay tuned, there may be more in your doorstep to come!